Dr. Notman is a Board Certified Family Medicine Physician from Bradenton, Florida. She attended Bradenton Christian School, received her Bachelors of Science Degree in Molecular and Microbiology from the University of Central Florida, and received her Doctor of Osteopathic Medicine Degree from Nova Southeastern University. She conducted her Family Medicine residency training at Larkin Community Hospital in Miami, Florida. The health and well-being of her patients is of the utmost importance to Dr. Notman. She practices Family Medicine and provides routine medical care. Her medical interests are Primary Care, including Adolescent Medicine (ages 10 and up) and Preventative Medicine. 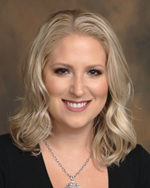 Dr. Notman met her husband at UCF, who was in the same bachelor’s degree program, and they attended medical school and residency training together. In their free time she and her husband enjoy snorkeling, horseback riding, and spending time with their dog, Snickers.